Last October I saw this salad posted by a blogger friend Geni and the minute I saw that lovely photo and recipe I told myself this will definitely be on my to do list as it looks so good and I have to try it. Today was that day and the recipe did not let me down and here is the adapted version from Geni, I guess I will let the picture do the talking this time. Mix all Soy and Citrus Dressing in a bowl then set aside. Arrange salad ingredients in a large salad bowl then dress with Soy and Citrus sauce. I love that citrus soy dressing. The weather has been getting warmer here in Hong Kong and light salads are perfect. Thank you so much for the compliment Raymund. You definitely made some great adjustments and it looks fantastic! 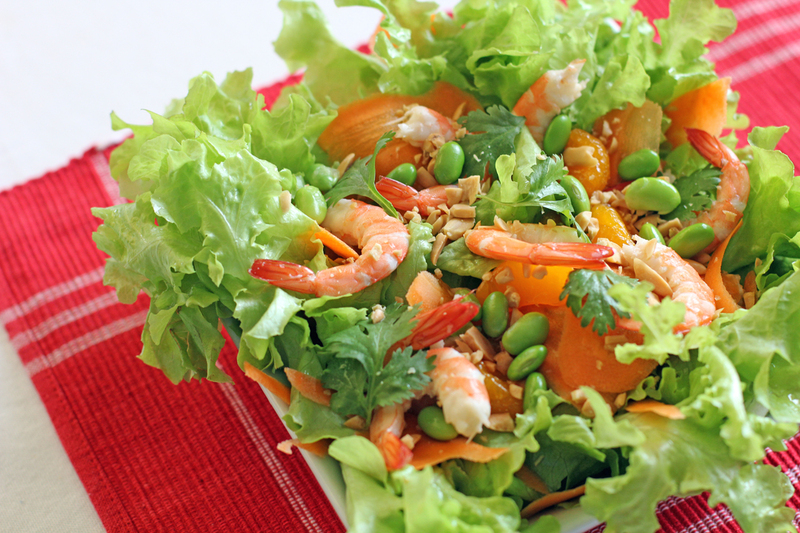 What a bright and beautiful salad — I especially like the dressing with fresh grated ginger –YUM. That salad looks delicious with the citrus. Interesting use of malt vinegar in the dressing, I’d love to give that a shot. That is a good looking salad, Raymund! I love the dressing. Lovely salad I have bookmarked for the weekend. Am still not quite used to including soy beans to salads and love the addition of mandarin oranges. Want to try the dressing – thanks!! Mmm this looks light and refreshing! Thank you for sharing this very wonderful recipe! I’ll definitely try this one of these days. It looks very delicious too, even the dressing itself. I haven’t had salad with shrimp for a long time. This caught my attention and I love your vinaigrette too. Love your vinaigrette has fish sauce. I’ve never done that before and I’m going to give it a try this week!